Hungry for the unusual, then you have come to the right place. We will feature bi-monthly menu items and descriptions from the upcoming Chez Zombie- Gourmet Zombie Eats Cookbook. You will be able to purchase an e-book version in the near future. We are not limited to rotting corpse palates, but will prepare dishes for most necro-gourmets still walking the globe. All content found on this website page 'Chez Zombie' are meant for purposes of entertainment and are not meant to be literally consumed in your real world. If you reuse any of the content found on this page or on the entire website without Z-compositon's written consent you will be prosecuted. You also may become a featured ingredient in one of the recipes used in Chez Zombie on-line café. We cannot nor will promise it won't hurt more than a little bit! If any of this content is taken literally and ends up in a court of law, we are not liable for your misguided judgment- all cannibals, take heed. Z-composition or its editors has no intention or has ever consumed the raw or otherwise flesh of a fellow human being. We are a wide range of carnivores, vegetarians and or vegans only. 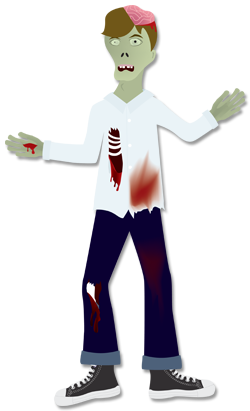 Zombies are the only known creatures (undead horror fiction) to consume large amounts of human flesh or brains of living human beings according to internet sites such as Wikipedia and a worldwide network of Zombie websites found on-line.